If you have registered at least one EZkeys Instrument already, you are eligible for the reduced "EZkeys Sound Expansion" to get the Small Upright Piano and save big! Basic - The default sound. The basic piano sound slightly tweaked with controls for EQ, reverb, key and pedal noise. Raw Tweaks - A true bypass preset that represents what the piano sounded like from the raw recording. Also, in this preset, you can adjust the level of hammer, sustain pedal and releases as well as detune the piano. Basic Acoustic - Another natural sounding setting with adjustable EQ, room reverb and hammer noise. Kingston Spring - Slight amounts of tape compression and saturation give character to this preset. Combined with the vintage spring reverb, you can give your sound a true Jamaican flavor. The Flower - Polished ’70s ballad piano. Tweak to your liking with EQ, compression and reverb. Social Club - A lot less polished, more throaty sound. Lots of room ambience available. Adjustable EQ, ambience, tape drive and hammer noise take you to another musical dimension. POP - A brighter setting with EQ, reverb and chorus controls at your disposal. Dried Out - This one can go from bone dry to ambient with the onboard dryer control and the reverb, EQ and chorus. Set the dryer control to max and add some chorus for a taste of the ’80s. Chorus and Delay - This preset features an adjustable tempo synchronized delay along with a classic chorus. The EQ lets you go from mellow to bright. Delay and Compression - Another synchronized delay. This time along with EQ and compression controls. Taste of ’90s - A bright, heavily processed, mid-scooped piano with compressed attack. Control the chorus EQ and delay. Made to cut through in the busiest of mixes. Modulation - An FX preset featuring a fluttery modulation effect, a tone knob and a reverse reverb. Digitalized - A sharp, punchy sound in the spirit of early synthetic pianos. Adjustable EQ, compression, chorus and sharpness. Modulated Filter - Another FX preset. This time we have a modulation filter, reverb and delay onboard. Play around with the modulation and discover anything from classic lo-fi tones to harpsichord with auto-wah sounds. Excellent deal when on sale, serviceable piano and convenient sketching tool. I love Toontrack products. Last year during the Black Friday promotion, I purchased the Retro Electrics, and this year I purchased the EZkeys Small Upright. I cannot recommend this product more highly to any songwriter wishing to take his creativity to the next level. 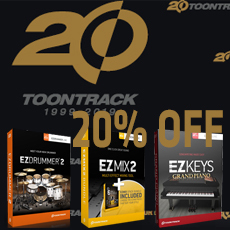 Toontrack products are very easy to use, and provide a wealth of inspiration to come up with new, great sounding backing tracks for your songs. Great product, great price, very happy with my purchase! Highly recommended!